Digital Printing (also known as Photocopying, Xeroxing, or simply “printing” in casual home use conversation) allows the printer to produce printed material from a digital file with relative ease and quickly. Offset Printing uses large machinery (called a printing press) to print large quantities of paper. Digital printers, especially when talking of home printers, are considerably cheaper to purchase compared to an offset printer. 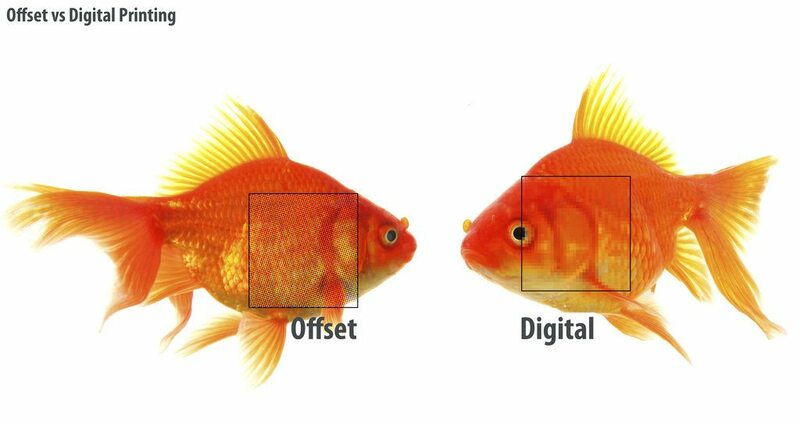 Offset printers have a lower cost per print and can thereby be more cost-effective when there is a large quantity of prints. Industrial printers (digital or otherwise) can cost tens to hundreds of thousands of dollars, with some printers having contracts that charge “per click” as well as an initial fee. A “per click” fee is a fee charged to the company for every page printed from the printer. Offset printing is a dying skill that is developed and perfected over many years. Offset printing involves a large process, including shooting and developing film, burning plates, ink preparation, and press maintenance. Digital printing is limited in resolution, with home printers ranging between 300-600 DPI (or dots per inch, may also be referred to as PPI or pixels per inch). The prints can often look pixelated depending on the input file. Offset printing has absolute resolution, comparable to painting a wall.